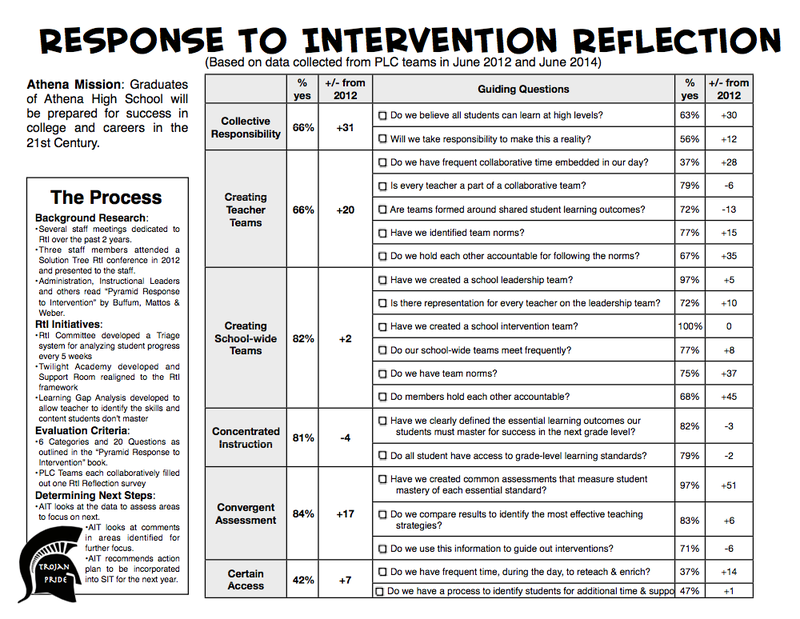 Digging Into Our Data: Each year we complete the Response to Intervention Reflection Survey in our PLC groups to track our growth, improvement and targets, relative to our efficacy in the area of our responses to intervention. We continue to for a third year to report that we are making gains in many of the RtI indicators. The data also reveal areas we can continue to improve on. AIT will use this data to guide the SIP development for next year in the area of RtI. Click here for a summary of the results for each area of the survey. 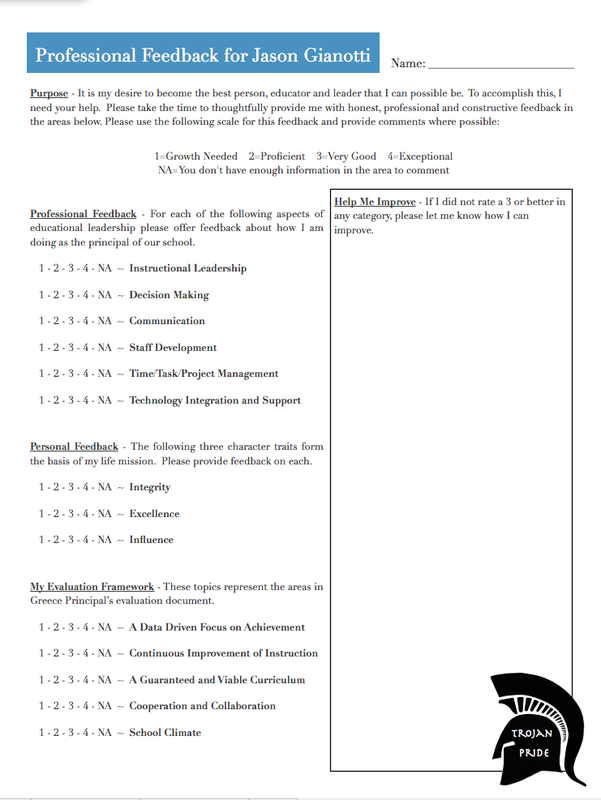 Principal Feedback Surveys: Please complete and return my feedback surveys asap (Click here to download another copy). Your feedback is invaluable to me as I seek to continually improve. Please be fair, honest and professional. I would appreciate it if you treat this the way you want your evaluations treated. Thanks. Year End Checklist – Prior to leaving for the summer on June 27th, you must complete the Closing Checklist. This document was put in your mailbox on Tuesday of this week. Do not leave without completing this document and handing in to Anna Christopher. 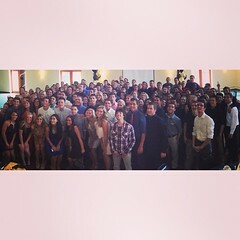 Graduation is Saturday June 28th at 10 pm – Join us is you can to celebrate another fantastic group of young men and women that we have helped mold and shape as they graduate from Athena. Tuesday June 24th is PLC Time – Use your Tuesday meeting time this week to prepare for your PLC Presentation or wrap up for the year. District Professional Development Day on Wednesday, June 25th – Click here to see where you are assigned. If you are not assigned to a district location see your administrator. Staff Breakfast on Thursday, June 26th – We will have a staff breakfast from 7:45-8:15 next Thursday before or final staff meeting of the year. Final Staff Meeting on Thursday, June 26th – We will hold our final staff meeting of the year at 8:15 on Thursday. Graduation Rehearsal – If you are signed up to participate in graduation please be at the APAC at 11:45 on Friday, June 27th. iPads and Laptops – If you have a district iPad or Laptop it must be turned in to Kathleen Harrison prior to the end of the day on Friday. The district technology guys will need time with these devices over the summer. 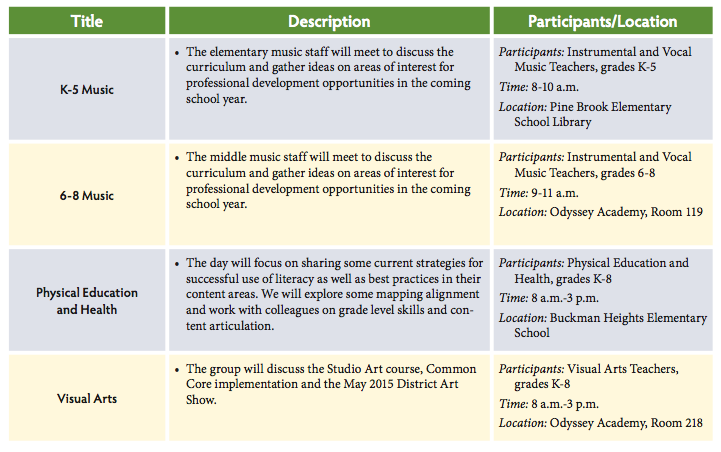 PLC Presentation Summaries – We have now completed about half of the PLC Presentations and they have been outstanding. Click here to view the summaries and PPT’s provided by some of the teams. 2014-2015 District Timelines and Calendars – Click here. AIT Representative Needed – If you are interested in serving on the Athena Improvement Team next year, we are looking for representatives. If you are a teacher please let John Clifford know. If you are a support staff member please let Kathleen Harrison know. Common Athena Syllabus Content – Click here to download a copy of the common syllabus information. Please copy and paste this into your syllabus for next year for all courses. A Parting Thought: Any group of educators committed to a common purpose, a collaborative instructional culture and professional standards can and will change the trajectory of any child regardless of all other factors. The students at Greece Athena need this from each and everyone of us. Today, as I write my last update as the Athena High School Principal I am energized by the work we have completed together over these past three years in each of these areas. It has been an honor and a privilege to serve this community along side each of you. Each of you is engaged in high and noble calling as an educator. The work you do is at times thankless and often exhausting, but it is always critical. I will miss each of you and look forward to hearing the great things that will result from your continued commitment to the mission of our school, a culture of collaboration and professionalism. Thank your for the opportunity to be your principal. Trojan Pride! We have now completed about half of the PLC Presentations and the work begin done across our building is phenomenal. Each team that has shared their growth and collaborative journey has continued to amaze the administrative team. These conversations continue to reinforce my firm belief that collaborative teams of professionals, focused on student learning are the most powerful force in education. Below are the documents provided by several of the PLC Teams that summarize the PLC Presentations that have been done so far. If your PLC is not listed below, it is because your team did not provide a digital copy of your documents. Please feel free to forward your documents to Jason Gianotti at any time prior to Wednesday, June 25th, 2014. 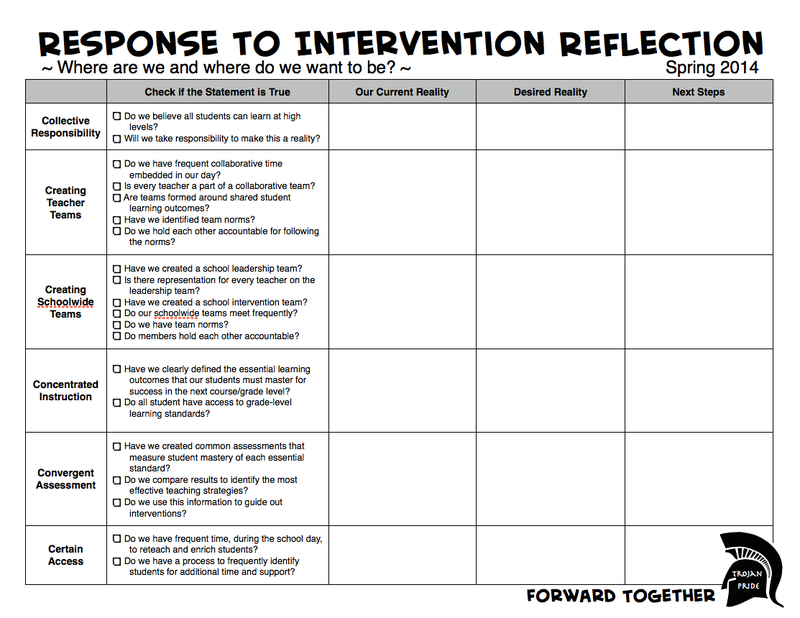 Each year we complete the Response to Intervention Reflection Survey to track our growth, improvement and target areas relative to our efficacy in the area of our responses to intervention. We continue to make gains in many of the target areas. The data also reveal areas we can continue to improve on. AIT will use this data to guide the SIP development for next year in the area of RtI. Here is a summary of the results for each area of the survey. Click on the image below to watch the outstanding A2T PLC Team presentation. once at the site, click on the “clock” icon at the bottom right corner and select “4 Sec Delay”. Click here for directions on how to add a zone printer to your computer. Senior Prank: This morning I arrived bright and early and our maintenance staff was cleaning up toilet paper that was strung through the trees in the back lot by seniors around midnight the night before. No students entered the building and the seniors involved came forward to own up to their actions and accept the consequences. Students were given a range of community service hours equitable to the amount of wasted tax payer money required to cover the cost of police, maintenance and administrative time to address and clean up. These students also helped us avoid a planned water balloon fight during lunch. While their actions the night before were not acceptable, I was proud that they owned up to it this morning and accepted the consequence with out argument. There were rumors that students were arrested last night. The police did not arrest any of the students as they had not entered the building and dispersed when the police arrived. Tuesday June 17th is a PLC Time – Use your staff meeting time this week to prepare for your PLC Presentation. PLC Presentations: Please refer to Kathleen Harrison’s email regarding the time of your PLC Presentation. Click here to review the expectations. Regents Exam Week Calendar – Click here for this year’s June exam calendar. AIT Representative Needed: If you are interested in serving on the Athena Improvement Team next year, we are looking for representatives. If you are a teacher please let John Clifford know. If you are a support staff member please let Kathleen Harrison know. Leadership Positions for 2014-2015 – Click here for a list of extra curricular and leadership positions you may want to consider applying to be a part of next year. Important Year End Dates – Click here for the updated list of important dates to end the year. Only 1 more days of school with students and then exams! The following surveys will be completed today during our department meetings. Paper copies have been given to department leaders. The Professional Feedback survey can be done anytime this week and is also to be returned to Jason. The Senior Reflective Conferences: Today is one of my favorite days of the year. Once again, students thrilled us as they shared their stories and the journey each of them are on as they head out from Athena. Once again, I was reminded of how essential each person in our school is to the development, shaping and molding of the next generation. Each of you are having a profound impact. The time and energy you spend investing into each young scholar here is more significant that you will ever know. I hope you all enjoyed today as much as I did. 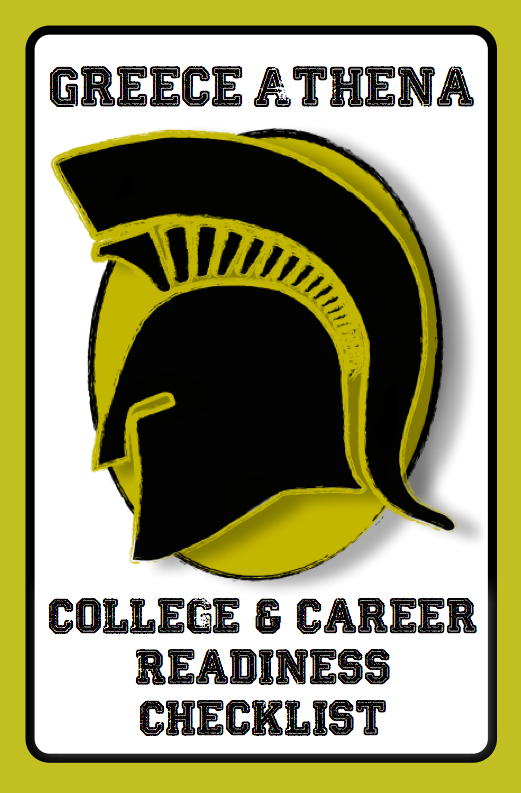 Defining College and Career Readiness: Have you ever wondered what it means to be “college and career ready”? 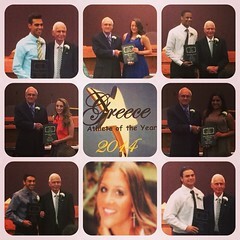 How do we know who is on track to be successful in college and/or career after leaving Athena? These are critical questions that we must explore as a school community. Over the past several months the College and Career Committee has been commissioned by AIT to tackle these questions. This committee was comprised of counselors, teachers, administrators, college admissions reps, support staff members and teacher leaders. Together we have developed two documents (a checklist and a timeline) that will guide our students, our professional development and our school community towards ensuring that each student is on track towards achieving our school mission. Click here to view these documents on the blog. Tuesday June 10th is a Department Meeting – We will meet as departments to complete the annual RtI Survey, review student lists and prep for exam week. Special Ed and Counselor Meeting – Both the SpEd department and the counseling department will meet iwht James during the Tuesday Staff Meeting to review the CDOS credential regulations. Please come to the meeting prepared to discuss any student who would have been on track to earn a local diploma in the past. Standing Meeting Tuesday June 10th at 2:50 – We will meet as a whole staff for minutes in the Forum Room following the Department Meeting. Common Athena Syllabus Content – As mentioned at the last Staff Meeting on Tuesday, we will all include our collective commitments in each syllabus next year. Click here to download a copy of the common syllabus information. Please copy and paste this into your syllabus for next year for all courses. 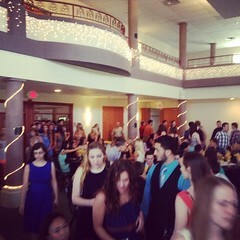 Junior Prom Pictures on the D&C – Click here to view. Leadership Positions for 2014-2015 – Click here for a list of extra curricular and leadership positions you may want to consider applying to be a part of next year. Deadline to let Jason know of your interest is June 10th. Only 6 more days of school with students! Finish strong! Have you ever wondered what it means to be “college and career ready”? How do we know who is on track to be successful in college and/or career after leaving Athena? These are critical questions that we must explore as a school community. Over the past several months the College and Career Committee has been commissioned by AIT to tackle these questions. This committee was comprised of counselors, teachers, administrators, college admissions reps, support staff members and teacher leaders. Together we have developed two documents (a checklist and a timeline) that will guide our students, our professional development and our school community towards ensuring that each student is on track towards achieving our school mission. 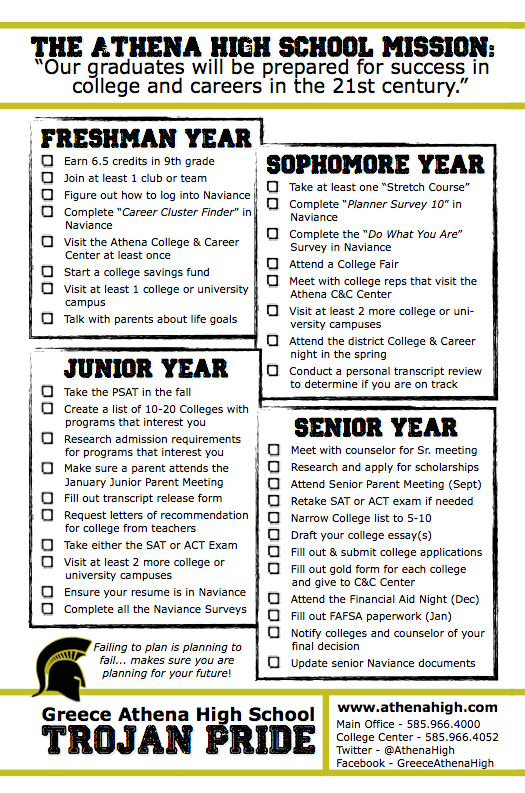 Document #1: The Athena High School College and Career Readiness Checklist – This simple one-page checklist provides a birds eye view of the 8-10 essential steps each student must take each year they are at Athena to stay on track for success. This document is located in every unit office, in the counseling and career centers as well as in next years student agenda and handbook. Both of these documents will continue to be revised as we grow, refine and improve our procedures and processes.